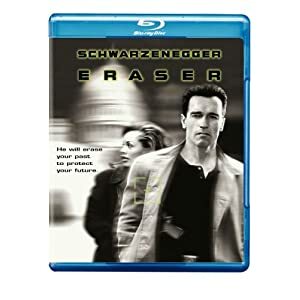 Eraser is another action movie for guys who love Ahhhnold (you must, or you wouldn't be reading this). Arnie plays John Kruger, an FBI agent who "erases" the past of people who enter the Federal Witness Protection Program. This time he is helping fellow FBI agent Lee Cullen (Vanessa Williams), who knows too much about secret government wrongdoing. As fans of Schwarzenegger films expect, there are bullets, explosions, and other great stuff that guys love (like alligators)! Lots of action, a little suspense, and a good plot keep the film humming along. More great one-liners, too. Worth seeing!